Despite a petition and wind chills between 15 and 30 degrees below zero, Binghamton University will hold classes today. Although classes are canceled until 12 p.m. today, students with afternoon classes will be expected to brave a wind chill warning and slippery roads and sidewalks to head to class. The University is one of several colleges and universities in upstate New York to remain open, including Cornell University. 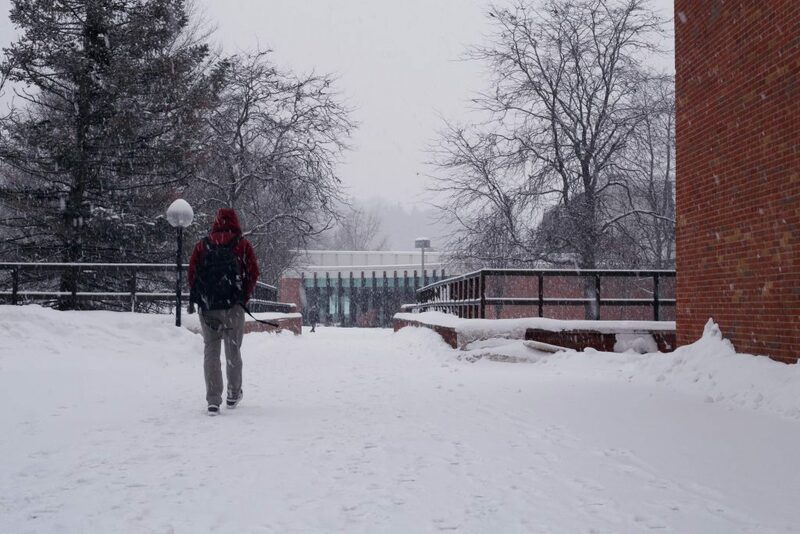 SUNY Broome and SUNY College of Environmental Science and Forestry at Syracuse University are closed entirely, and Syracuse University canceled classes last night, but reopened on Thursday. Several other schools also opted for delayed openings, with SUNY Cortland canceling classes until 12 p.m. and Colgate University canceling classes before 9:55 a.m. The University also announced that Off-Campus College Transport (OCCT) buses will begin service at 11 a.m. BC Transit is running as scheduled. The cancelation of morning classes was announced via a Dateline and B-Line statements released at 5:40 a.m. on Thursday, after BU’s decision on Wednesday night to remain open drew criticism from students, parents and faculty, who quickly organized a Change.org petition to push University administrators to cancel classes. In the petition, which garnered more than 10,000 signatures, students cited the “dangerous cold” and “slippery sidewalks” as reasons the University should consider canceling classes. Others called the University “irresponsible,” and parents questioned the safety of students and staff forced to walk to class in the sub-zero temperatures. The National Weather Service has placed Broome County and much of Central New York under a wind chill warning until 6 p.m. today, cautioning that the temperature and wind chill could cause frostbite in just 30 minutes. On Wednesday night, a record low temperature of eight degrees below zero was set in Binghamton, according to the National Weather Service. According to Ryan Yarosh, BU’s senior director of media and public relations, the decision to cancel classes is made by a team of 12 people including BU President Harvey Stenger, Dave Hubeny, director of emergency management at BU and John Pelletier, chief of Binghamton’s New York State University Police. It costs the University roughly $2 million each time classes are canceled. On Wednesday evening, the University also posted an article containing tips on staying warm and safe during extreme cold. In response to the article, students, parents and faculty expressed concern over the University’s decision not to cancel classes. In a comment on the University’s Facebook post with the article, Sophia Geringswald, a junior majoring in political science, wrote that she was concerned about getting to her classes from her apartment in Hillside Community without freezing. In another comment, Mary O’Neill, a senior majoring in anthropology, wrote that the freezing temperatures also impact students driving to campus, who have to walk to classes from commuter parking lots. Although the University canceled morning classes, as students bundled up to get to afternoon discussions, labs and lectures on Thursday, some were still concerned about the temperatures outside. Kaitlyn Campbell, a senior majoring in philosophy, politics and law, said she was concerned about traveling to her afternoon class, which is in the University Downtown Center. Campbell, who lives in Susquehanna Community, said she also worries about waiting for buses in the frigid weather.